I was looking for a different recipe to make with shrimp than my usual stir fry or shrimp scampi. 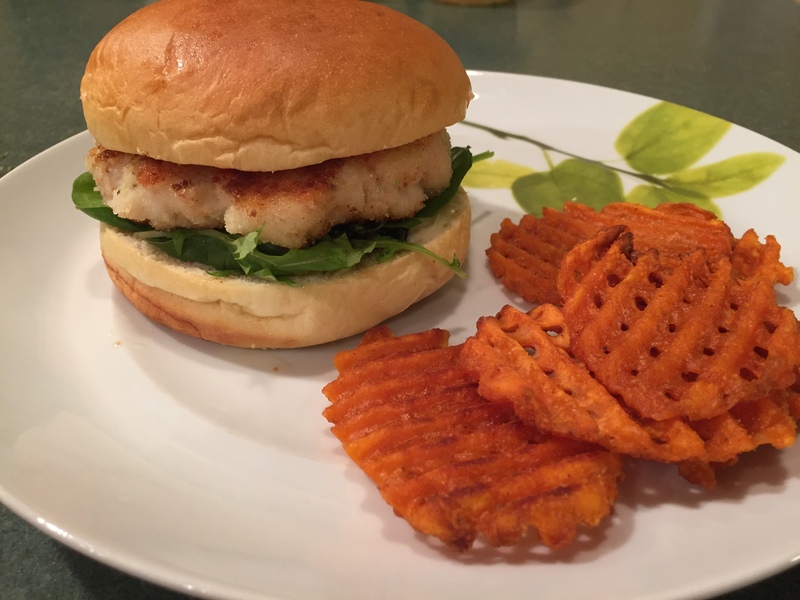 I found a shrimp burger recipe on Food Network but I was not pleased with the results. 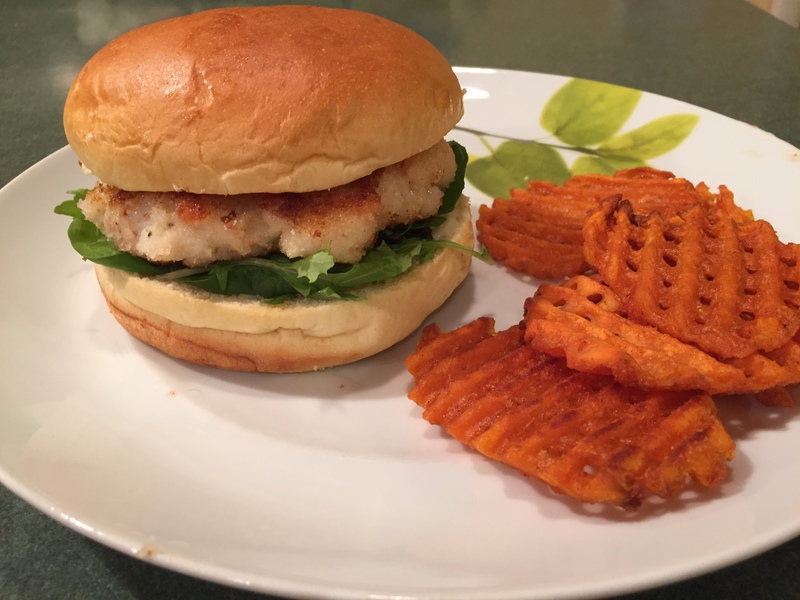 Then this recipe was posted on my America’s Test Kitchen subscription site and I was excited to try. 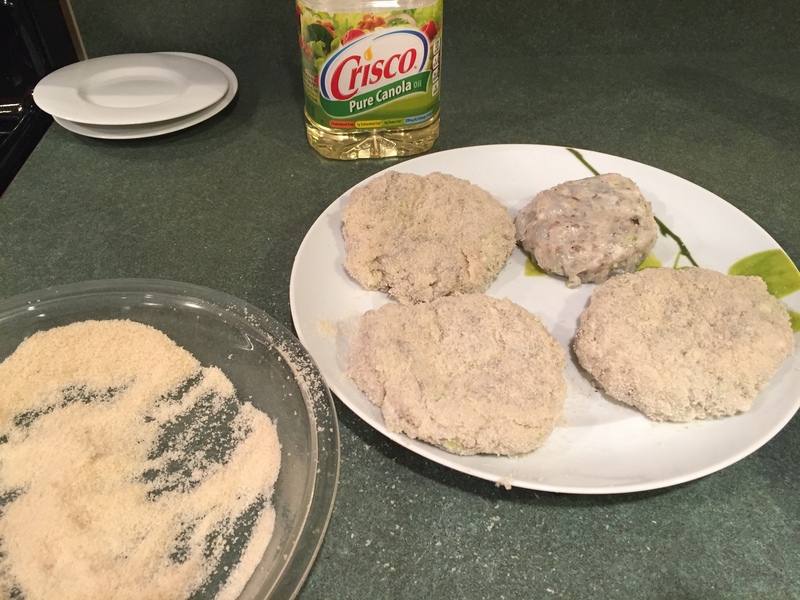 It had similar ingredients to the Food Network recipe but with a unique twist: finely ground Panko breadcrumbs. Just this small change makes this a great recipe. I have made it 3 times and it is excellent, thumbs up from all my family, my best critics!! This is a fairly easy weekday dinner possibility. The longest process was de-shelling and de-veining the defrosted frozen shrimp. But if there is anyway for you to get them fresh from your fish monger, already cleaned and de-veined, this recipe is a cinch. 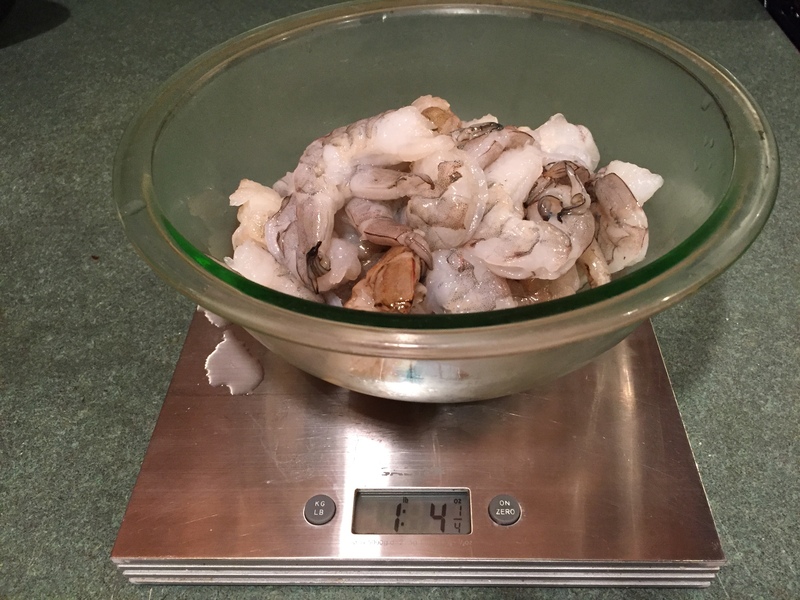 If you have to use frozen shrimp, you will need 1-3/4 plus pounds. I bought Hellman’s Tartar Sauce, so I did not include their tartar sauce recipe here. I probably will make the tartar sauce from the recipe at some point, it sounds really yummy. But in the mean time, instructions are in the original recipe. Pulse panko in food processor until finely ground. 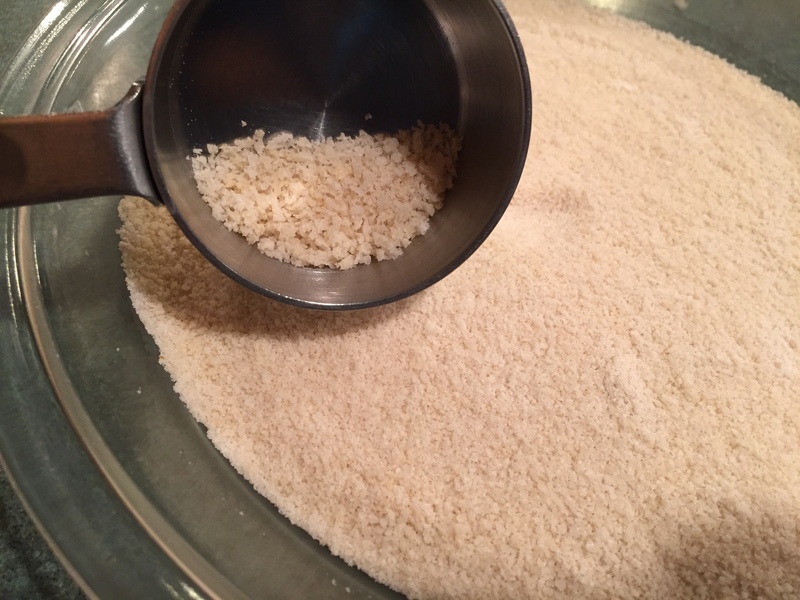 Place panko in a shallow dish (like a glass pie dish). Finely chop the bunch of scallions and set aside. 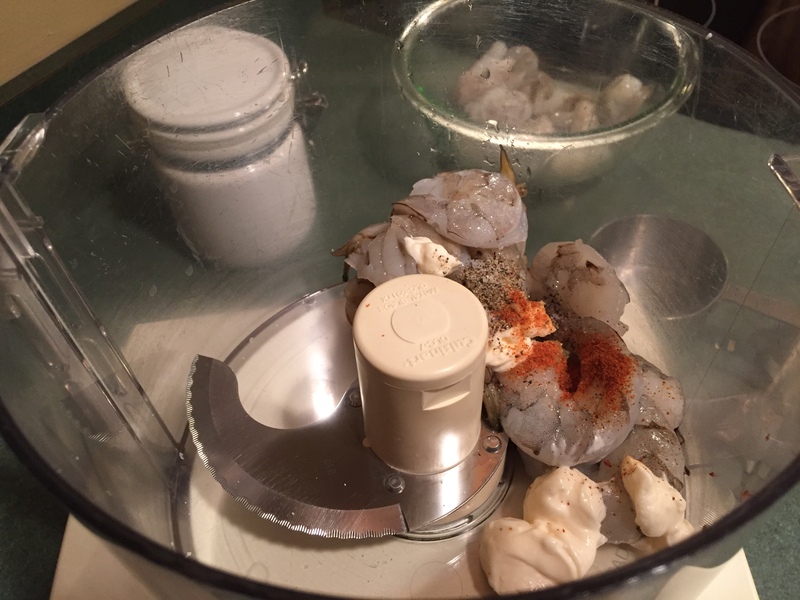 Place 1 cup of shrimp, mayonnaise, pepper, salt and cayenne pepper into empty food processor and finely chop using the pulse button. You will need to take off the top to look at it. It may take 8 or more pulses to achieve this. 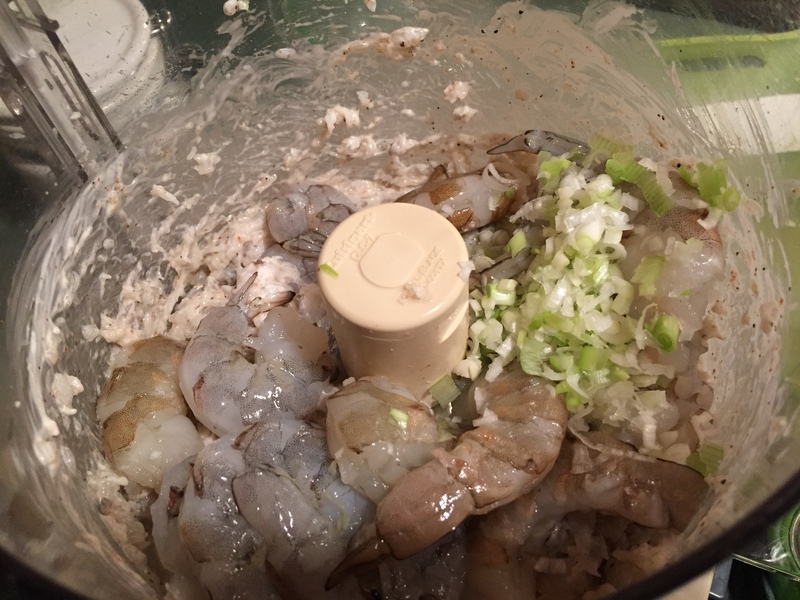 If there is a somewhat whole shrimp in there, don’t worry it will be ok.
Add the rest of the shrimp and the finely chopped scallions and pulse until coarsely chopped, 4 or more pulses. If not sure, take cover off and look and pulse a couple more times if needed. 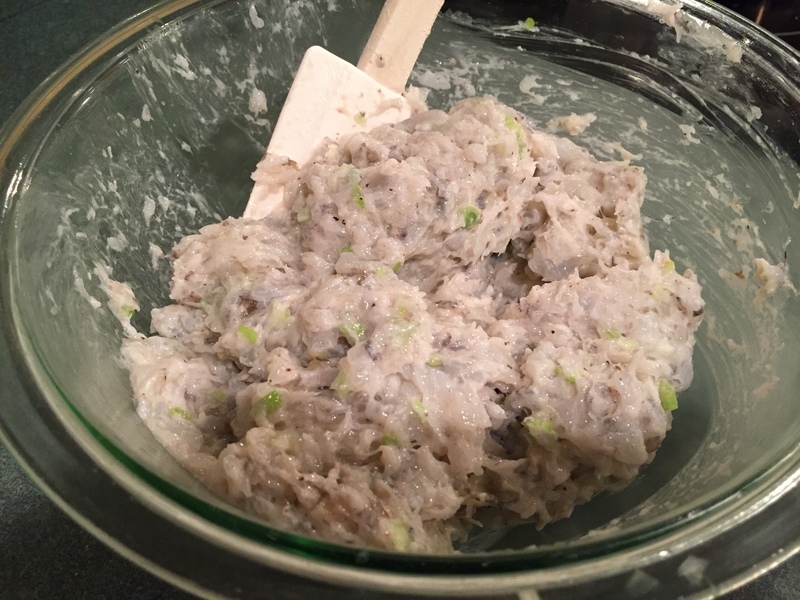 Place mixture into a bowl, mixing if necessary to make sure the scallions have been dispersed evenly. Divide shrimp mixture into four, 1/2 cup mounds onto a plate. At this point, you can cover lightly with wax paper and put them in the refrigerator until you are ready to cook them. Set the largest non-stick fry pan you have, on medium heat. Pour in about 1 tablespoon of vegetable oil and let heat up. Take one mound of shrimp mixture and place in shallow dish with Panko. 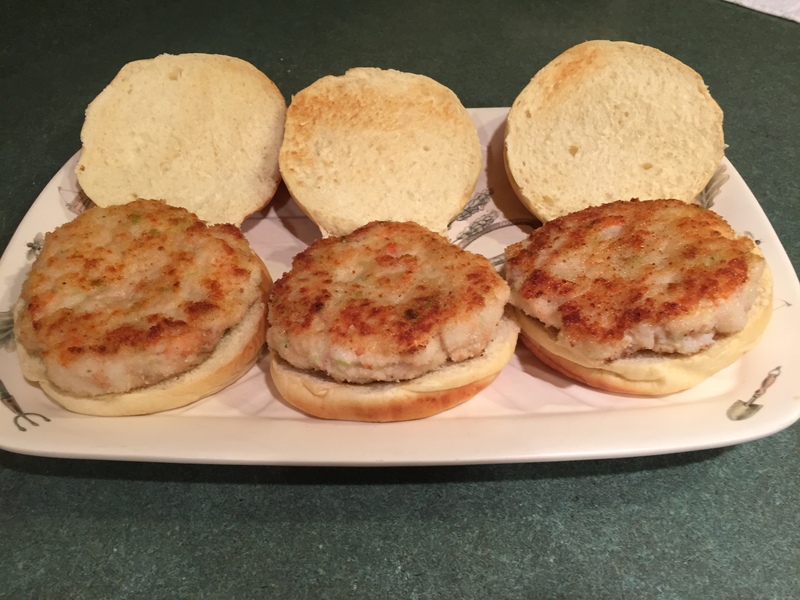 Turn shrimp mound gently over and pat into a 1/2 inch to 3/4 inch patty. I find this immensely easier once the shrimp is covered with Panko crumbs. Place on a clean dish. Continue with the other 3 shrimp mounds. 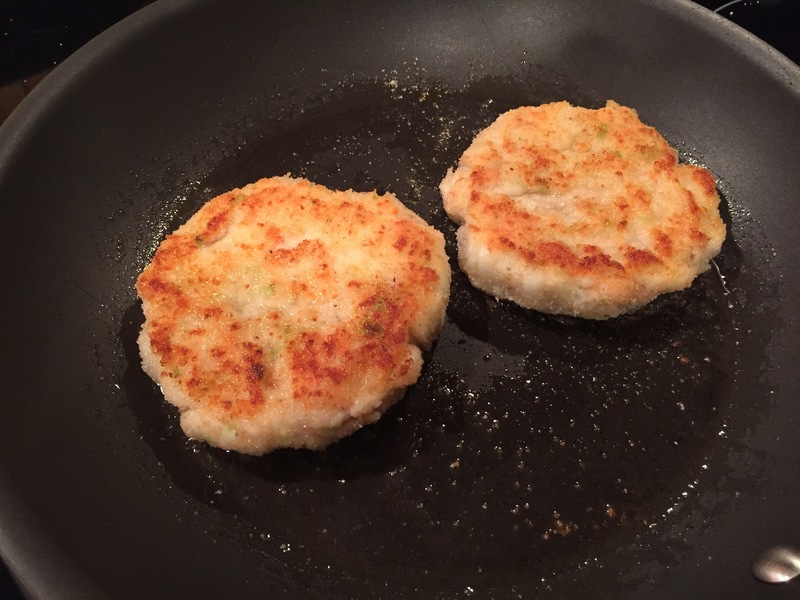 Place shrimp patties into fry pan. I could only fit 2 into my fry pan. Cook for 3-5 minutes until golden brown (you may have to reduce the heat a bit so that they don’t burn, just keep an eye on them) and flip over gently onto other side. Cook for another 3-5 minutes. Remove patty onto a another clean plate. Repeat with other patties, if need be, adding more oil. When patties are done, place on toasted rolls. 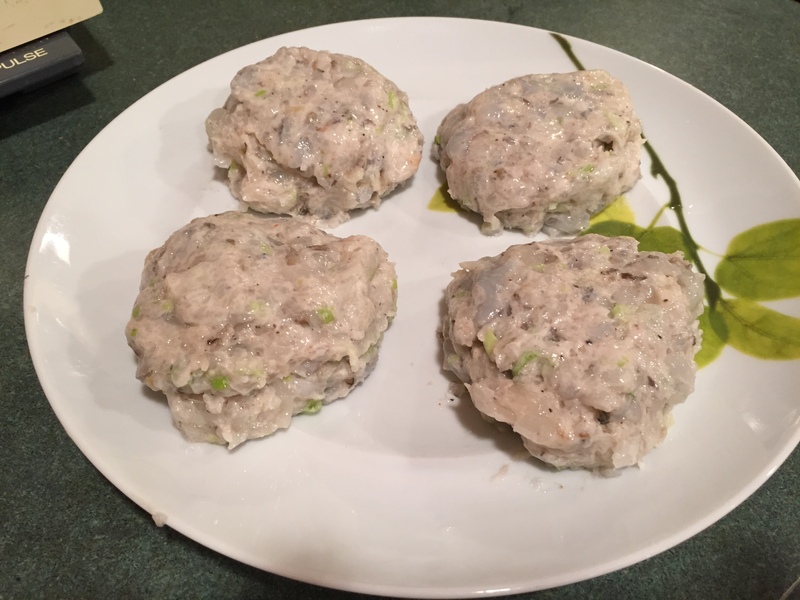 Serve with lettuce and tartar sauce. I also served them with french fries and sweet potato fries. Yummy! Oh Sue, my mouth is watering. These sound wonderful! I can’t wait to try them. Thanks for sharing!